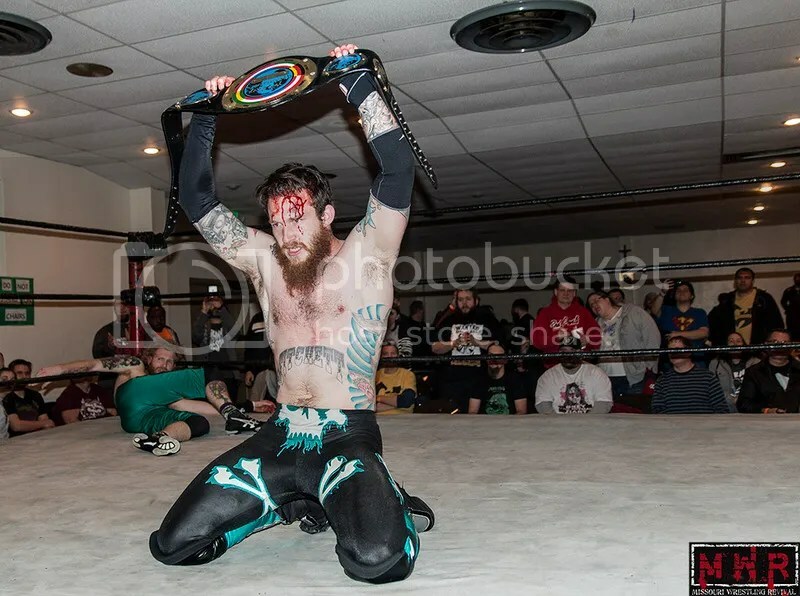 Davey Vega acknowledged the passing of Darren Dean, who had competed for St. Louis Anarchy on a few occasions(usually teaming with Aaron Solo(w)). That segued into the ten-bell salute. Justin D’Air & The K.C. 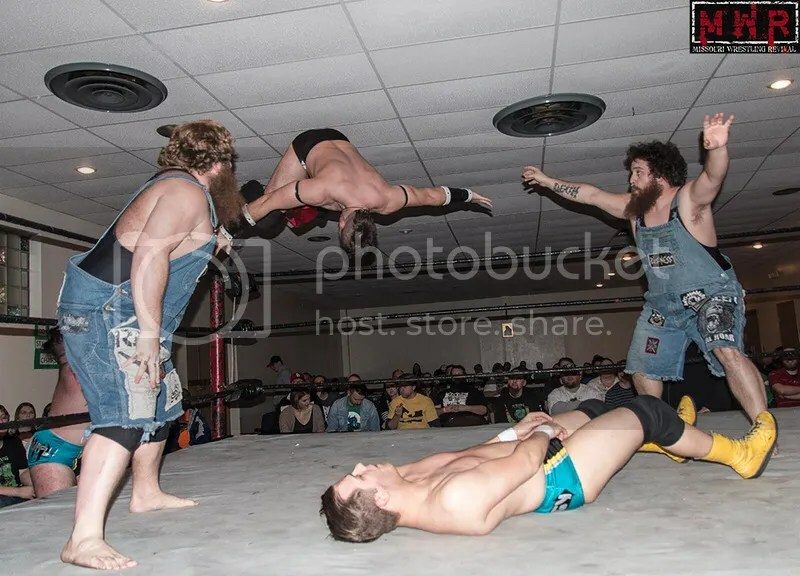 Wolves(Luke Langley & Graham Bell) vs. Kevin Lee Davidson, Sean Orleans, & Kody Krash: This was K.L.D.’s debut and he made an immediate impression as D’Air and the Wolves did their best to prevent his entry into the match. However, the big man got a tag and it was downhill from there for the opposing trio. 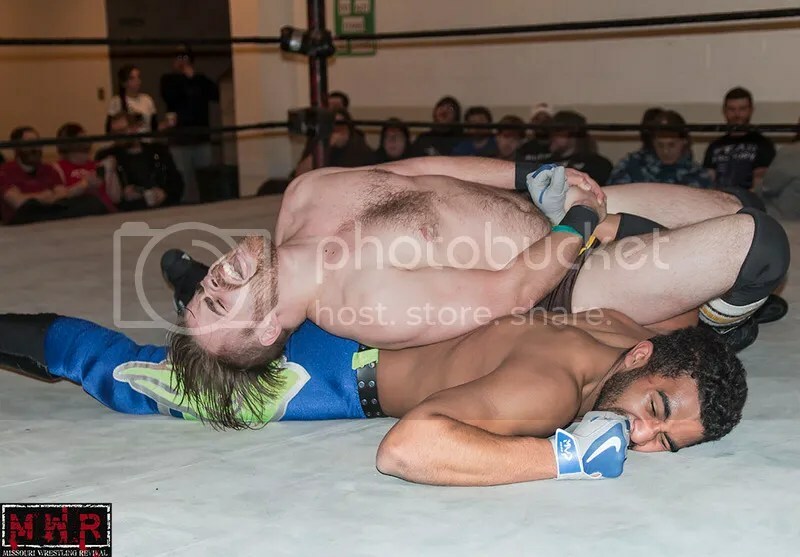 The finishing sequence saw multiple dives until only Orleans was left in the ring…however, Orleans loudly proclaimed that he wouldn’t risk his neck with such a move. 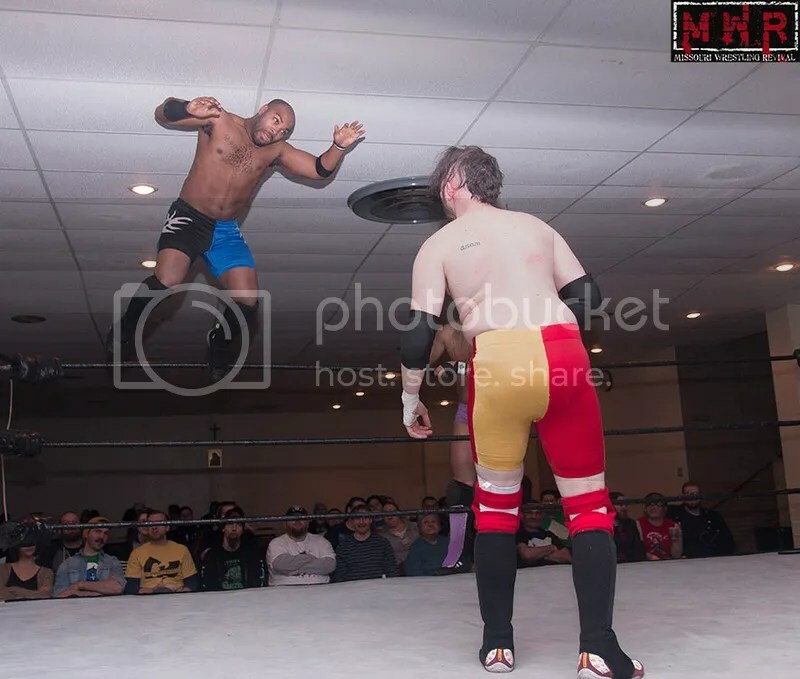 However, Bell got a hold of Orleans and Awesome-Bombed him over the top rope onto everyone else at ringside! K.L.D. 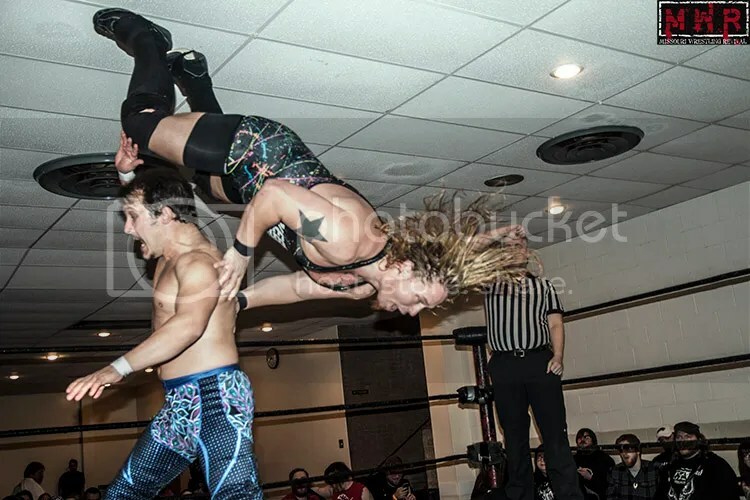 finished Langley with his spinebuster finisher in 14:02, lifting Langley high enough that his head bumped a ceiling panel…the big man got over in a major way in his St. Louis Anarchy debut. “The Money” Matt Cage vs. Paco Gonzalez: Cage wore a “Straight Outta My Closet” T-shirt in rainbow colors…heh. Paco finally got trunks and Cage acknowledged the wardrobe change by noting that he got his “big-boy pants”. Paco went for the anklelock multiple times in the match, resulting in Cage limping in the late stages of the bout. That tactic led to his downfall as Cage countered the last anklelock attempt into a victory roll pin in 13:55. 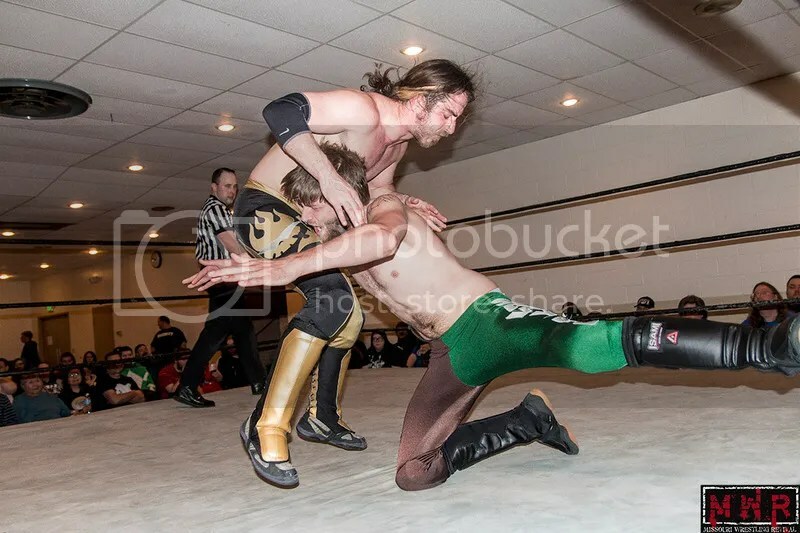 Alex Castle attempted another sneak attack, but Cage saw him coming and Castle backed off. 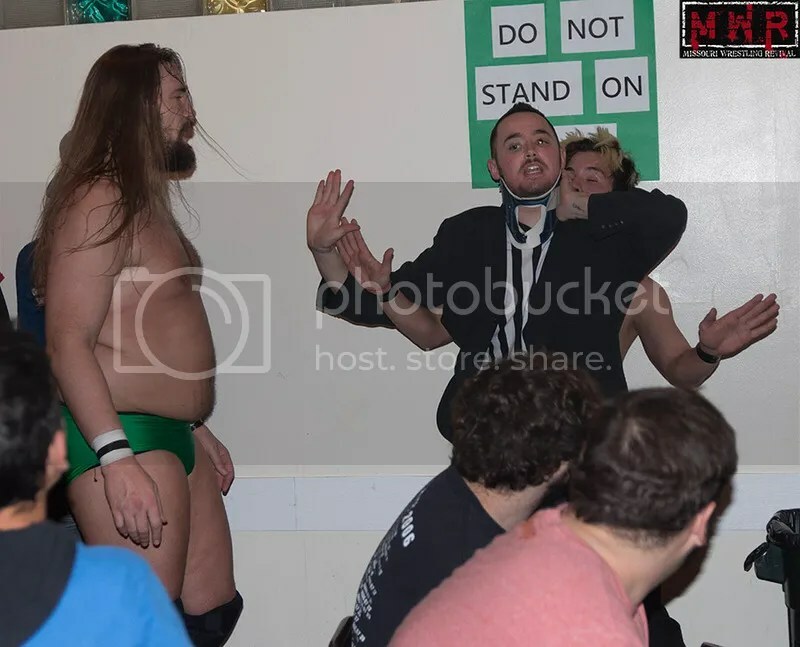 That led to Cage speaking his mind about the implosion of the Kentucky Buffet tag team…he said that Castle let his other relationships get in the way of the team’s success. They did a good job of building to the following night’s last-man-standing match between the two. Oddly, it turned out to be the shortest match of the night as it was the only bout to go under ten minutes. Rose got the tapout win with the No-Leaf Clover (Liontamer-style Boston crab) in 8:36. Stephen Wolf vs. “Buck Nasty” Bucky Collins: Hadn’t seen Bucky in several years(think he worked for High Voltage Wrestling a few times. Bucky’s an entertaining heel and the women in the audience were decidedly unimpressed by his mannerisms. 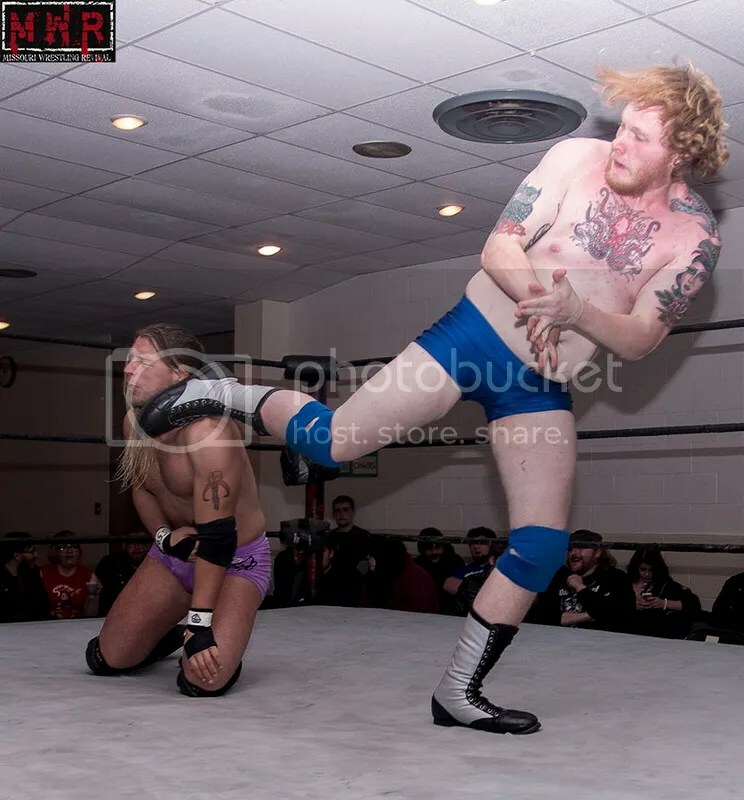 Buck Nasty won a good match with a crucifix bomb in 12:58. 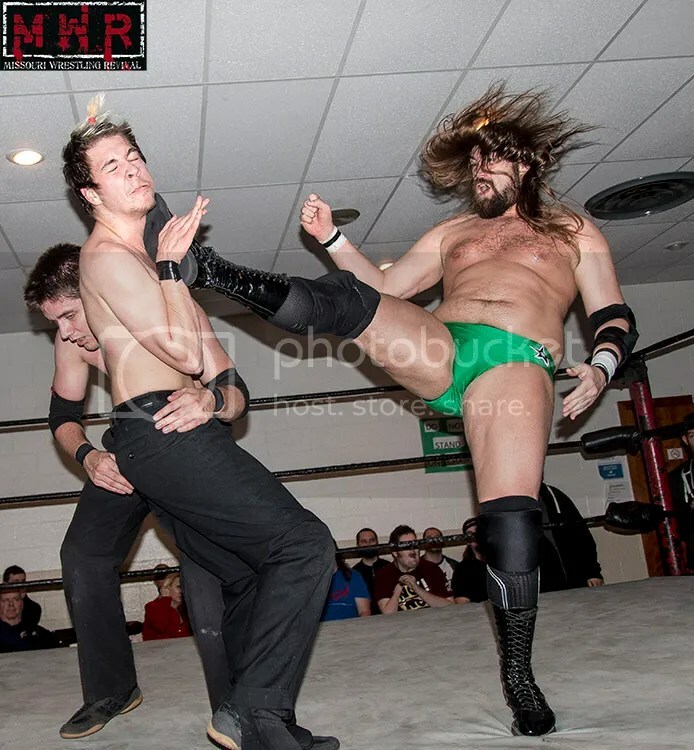 Both guys were fan favorites in this one, though Reno seemed to be the subtle heel. 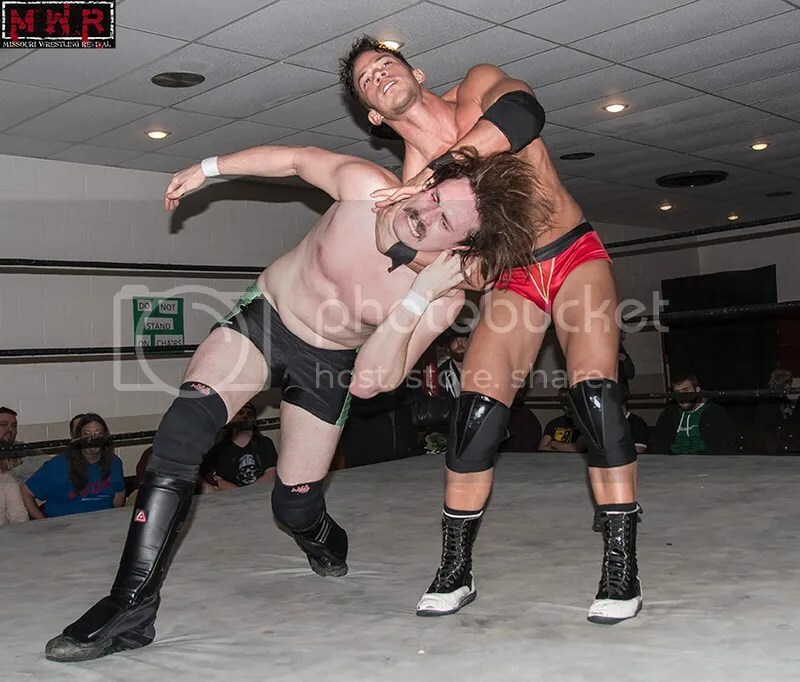 It could have gone either way, though Zakk recently challenged Gerald James for the Heavyweight Title. 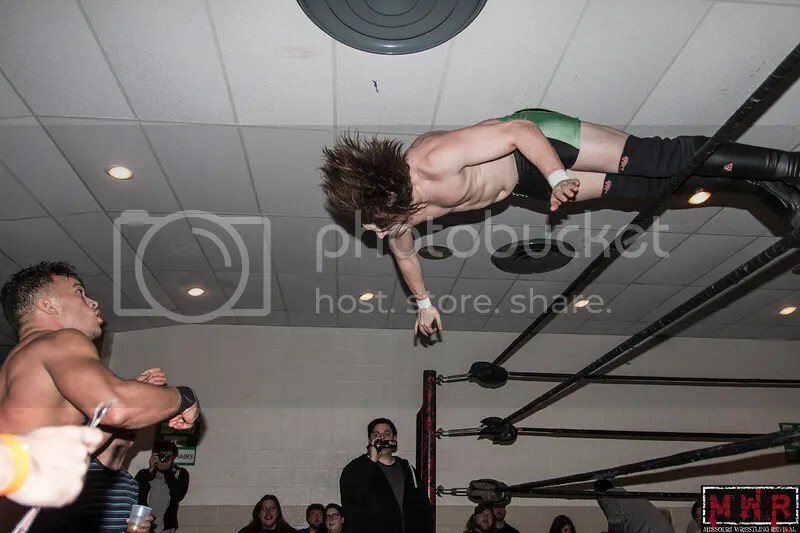 Sawyers stepped off the turnbuckles and jumped backwards into a Diamond Cutter variant, getting the pinfall in 14:51. 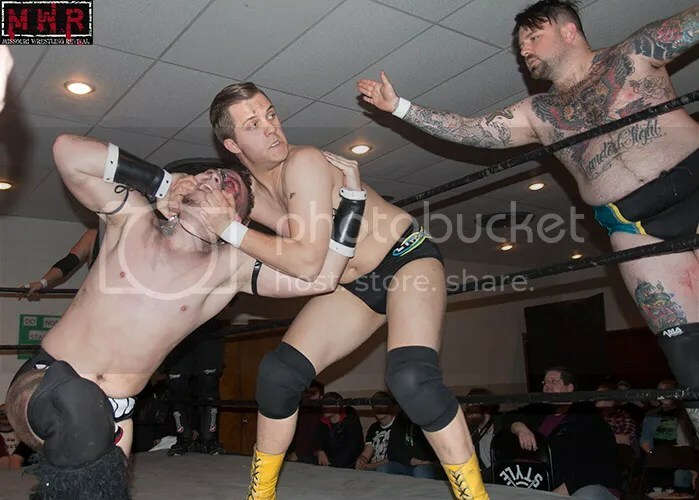 The Cause (Evan Gelistico & Adam Caster)(w/ Danny Adams, Everett Connors, & referee Austin Blackburn) vs. 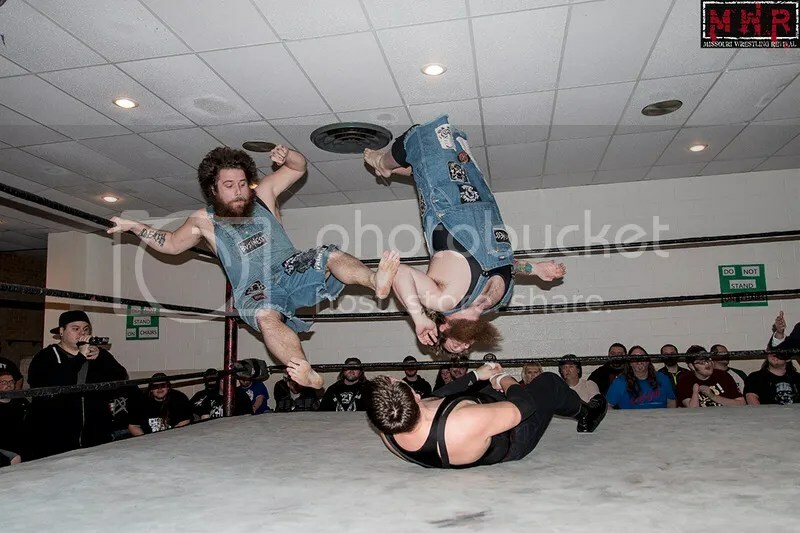 The Hooligans(Devin & Mason Cutter) vs. 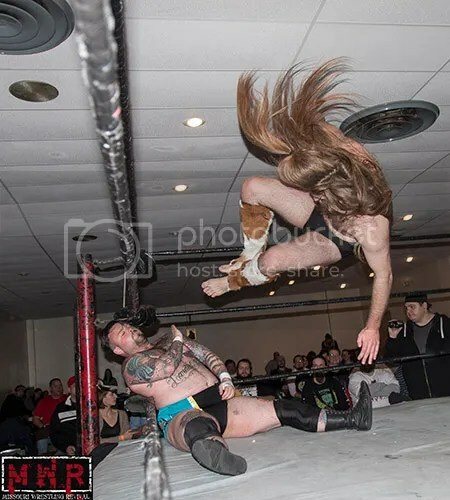 The Viking War Party(“American Viking” Alexander Rudolph & “Littlest Viking” Jake Parnell) vs. Team I.O.U. (“The Down-South Dandy” Nick Iggy & “The Music City Mutt” Kerry Awful) for the Tag Team Titles: This was the Anarchy debut for Iggy and Awful; they were in the rule breaking role with two very popular teams as the other challengers. This was as chaotic as expected; I.O.U. would get a better chance to shine in their standard tag match on the Sunday show. Parnell attempted a tiger suplex on Caster that didn’t do either guy any favors. The Vikings dished out a huge pileup of humanity as Parnell hit a Codebreaker on Awful, then Rudolph choke slammed Iggy onto Awful as Parnell held Awful across his knees! Chaos broke loose at that point, allowing Mr. Gelistico to steal the fall on Iggy in 12:30. Davey Vega vs. “The Rebel” Jeremy Wyatt (w/ Greg Jovi): Jovi interfered a bit, which led to Vega sliding out of the ring and wiping out the manager with a pump kick…bwahahaha. Wyatt focused his attack on the leg to potentially set up for his hanging half-crab submission hold…he got Vega in a figure-four leglock at one point, but Vega got to the ropes to escape. Wyatt went for the hold again and Vega small-packaged him for the flash pin in 29:27(!). Surprisingly, Wyatt offered a post-match handshake and Vega accepted the gesture without incident…though Wyatt swiped a kid’s pizza on the way to the backstage area. Intermission~! Given the length of the show, I indulged a bit and had a total of four sodas: Two Mountain Dews, a root beer, and a Pepsi. There’s your Official Ben Simon Concession Count(tm). 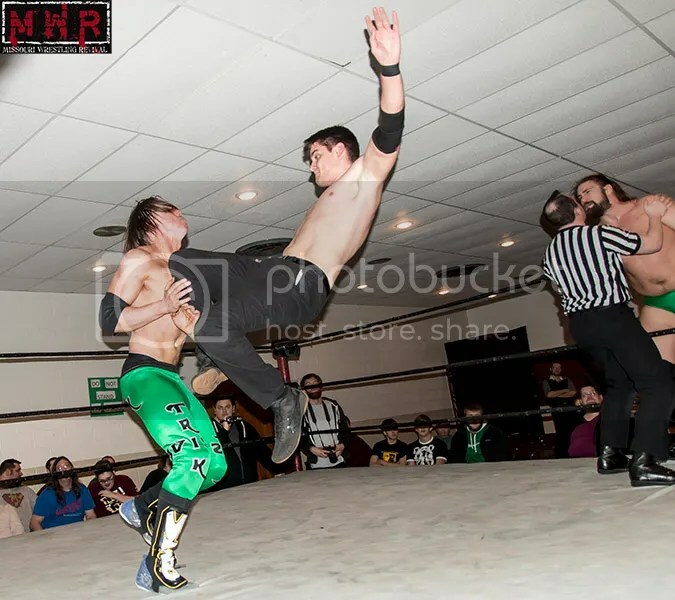 “The Big Mustache On Campus” Mikey McFinnegan vs. “Absolute” Ricky Starks: Starks was on cloud nine after his recent appearance on NXT…of course, that lasted all of about ten seconds and most of his TV time was being chucked out of the ring by Colin Cassady. 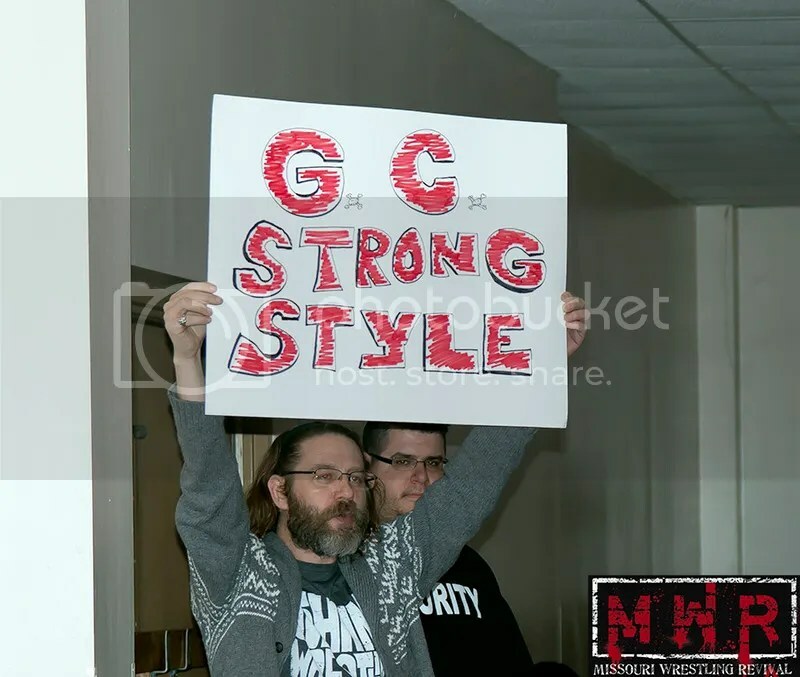 He felt like he was on his way to bigger and better things and took on a decidedly arrogant attitude as a result…he even had an “I’m A Hugger” T-shirt that he personally received from NXT Women’s Champion Bayley Rose. McFinnegan tried on the shirt for size, much to Starks’ dismay. 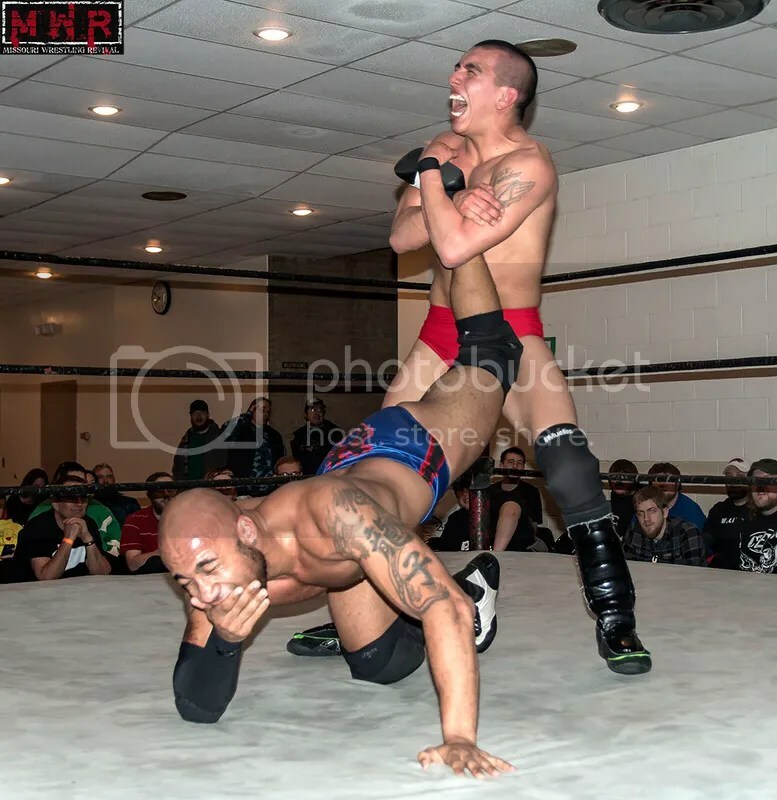 They had a fine match, ending with Starks hitting the double-underhook faceplant in 11:58. Jojo Bravo vs. “Dirty” Andy Dalton: Jojo’s been in a bit of a slump recently, partially due to questionable calls by the officials. Of course Dalton will take any opportunity presented to him, so that was right up his alley. Bravo had the momentum, but a near-collision with the referee gave Dalton the opening to deliver an undetected punt to the Universal Weak Point(tm). Dalton rolled up Jojo for the win in 10:13, adding to Bravo’s existing frustration. 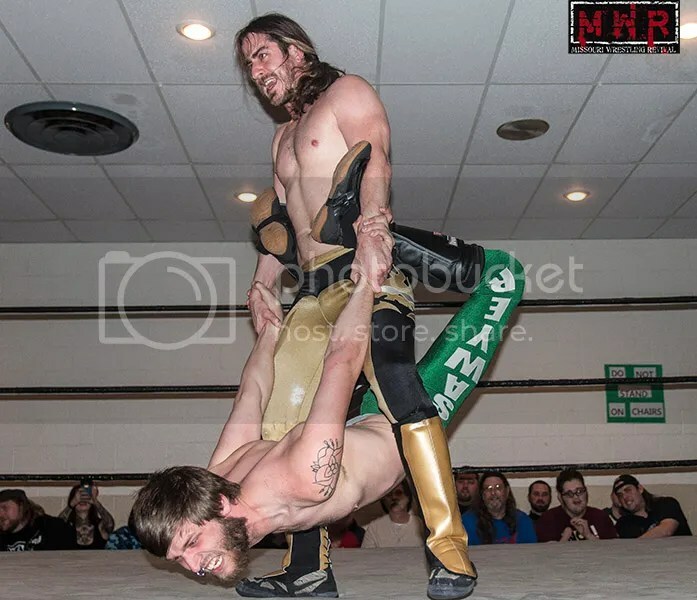 Chris Hero & Trik Davis vs. Danny Adams & Everett Connors (w/ Tag Team Champions Evan Gelistico & Adam Caster & Austin Blackburn): Right around 11:00 PM, Hero was ready to go for this penultimate match of the evening. 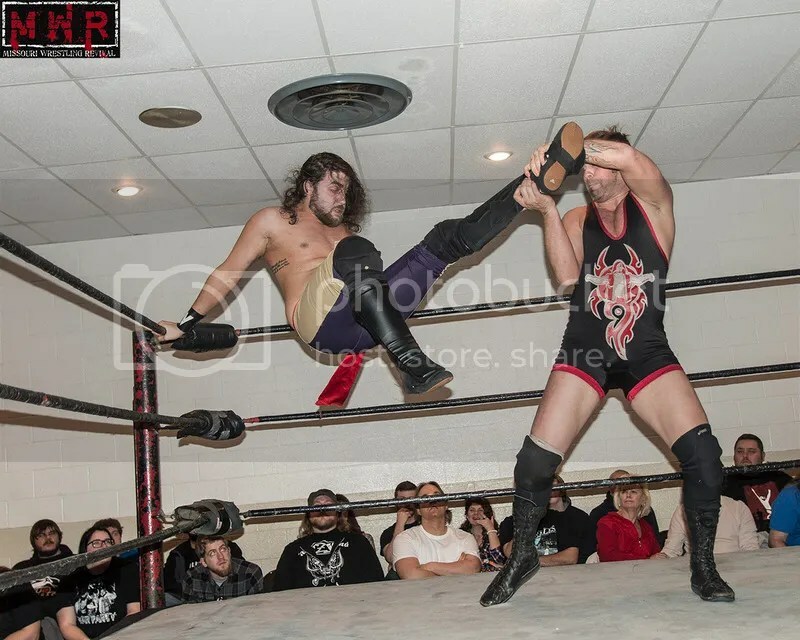 Hero and Trik go way back, dating back to their early days in IWA Mid-South. If I was fantasy-booking, I would have liked to see him against Christian Rose…Rose’s style was compared to Hero’s for a little while. Perhaps that could happen down the line…hint hint. The match got a lot of time. 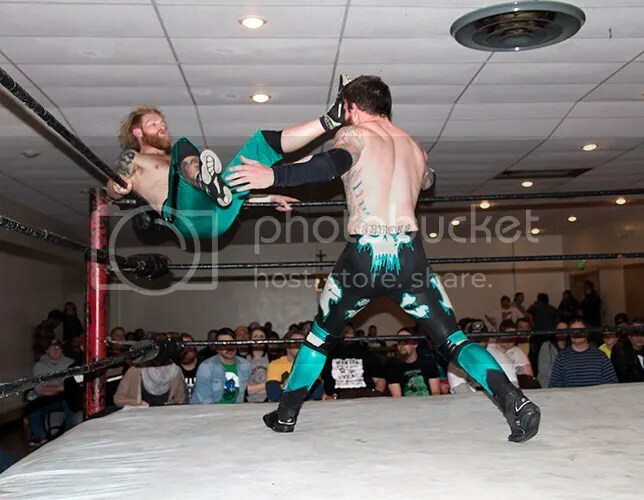 Hero hit the Death Blow(Rude Awakening setup into a roaring elbow to the back of the head) on Adams, then Davis followed up with a Diamond Cutter and Hero got the three-count in 24:23. 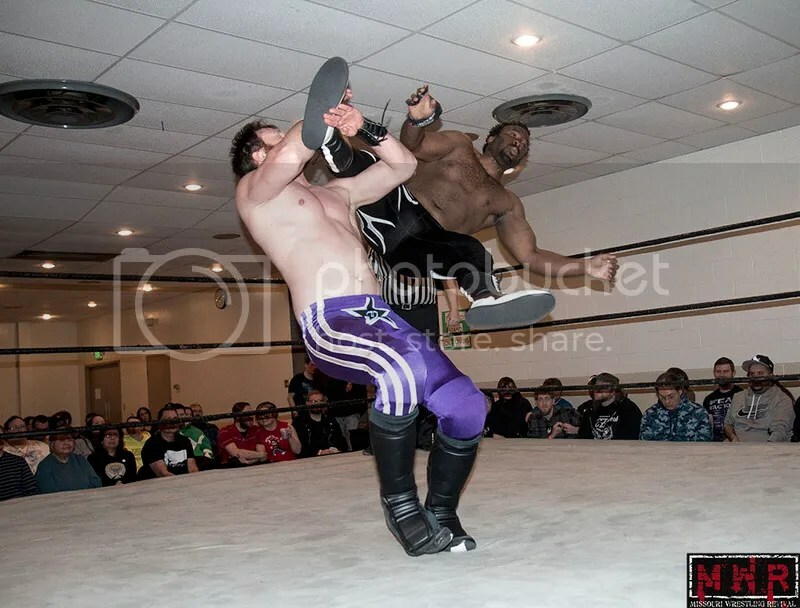 Gerald James (w/ Dorian Victor) vs. Mikey McFinnegan best-of-three-falls for the Heavyweight Title: James had held the title for a mind-blowing 862 days (over two years and totaling 28 months). Fitchett battled James on several occasions, winning some non-title encounters but never being able to unseat the champion. That included one particularly humbling encounter when James beat him in two straight falls. 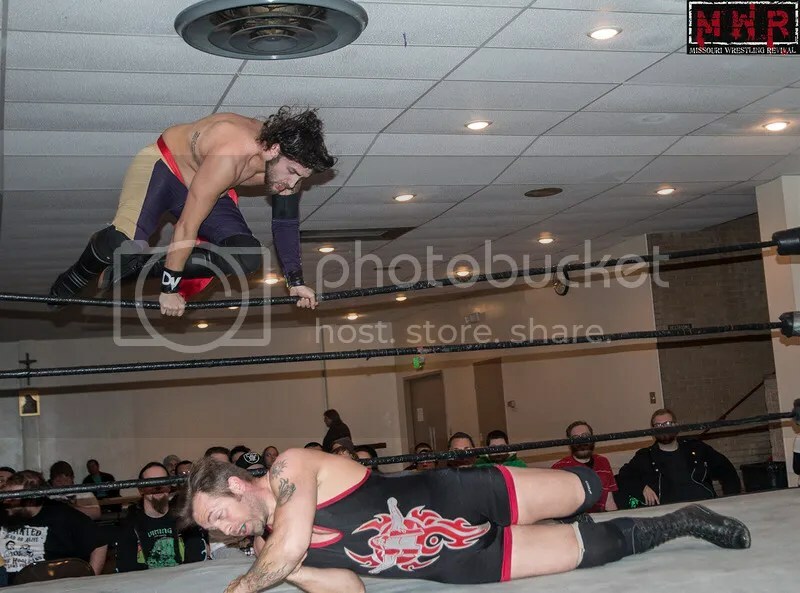 Fitchett infiltrated the BOSS stable under the Dangerous Deveroux mask and nearly cost James the title to Davey Vega, but it was not to be…however, Fitchett earned one more title shot with his victory in the Anarchy Rumble in November. Notably, Victor went to the backstage area instead of staying at ringside for the main event. They went right after each other from the opening bell, throwing huge bombs right out of the gate…knowing the people involved, that says a lot. Gerald won a quick first fall with the Michinoku Driver in a brisk 3:24. 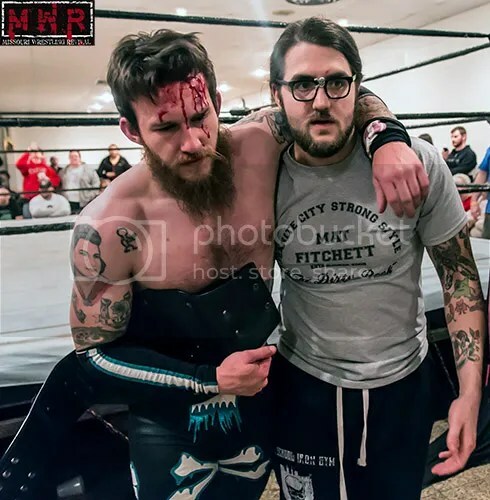 Fitchett lifted Gerald into a torture rack and dropped him into a reverse Go 2 Sleep(hitting the knee to the back of the head) for a near-fall, but hitting the move a second time was enough to even the score in 6:13. 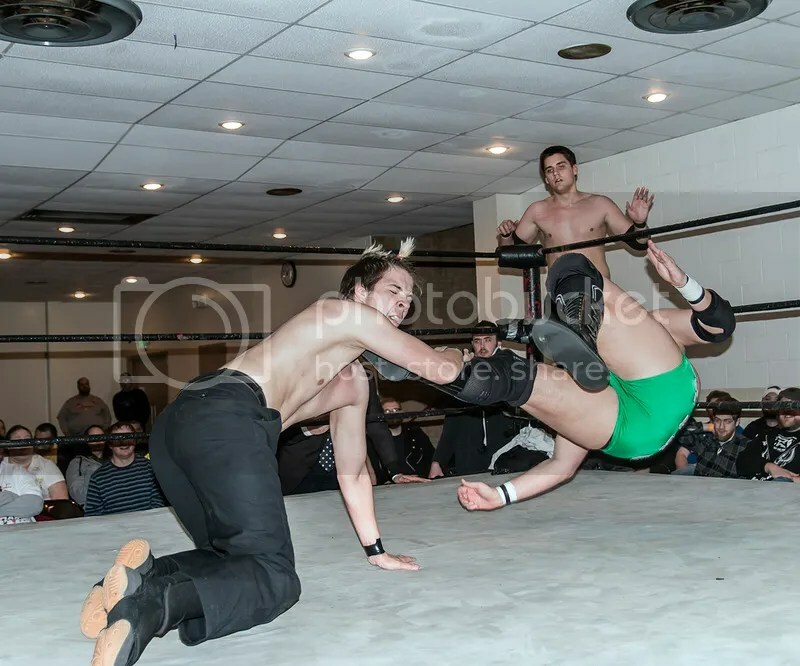 Things got really wild in the final fall as Fitchett lawndarted Gerald into the wall, then hit the cradle piledriver in the ring for a near-fall. 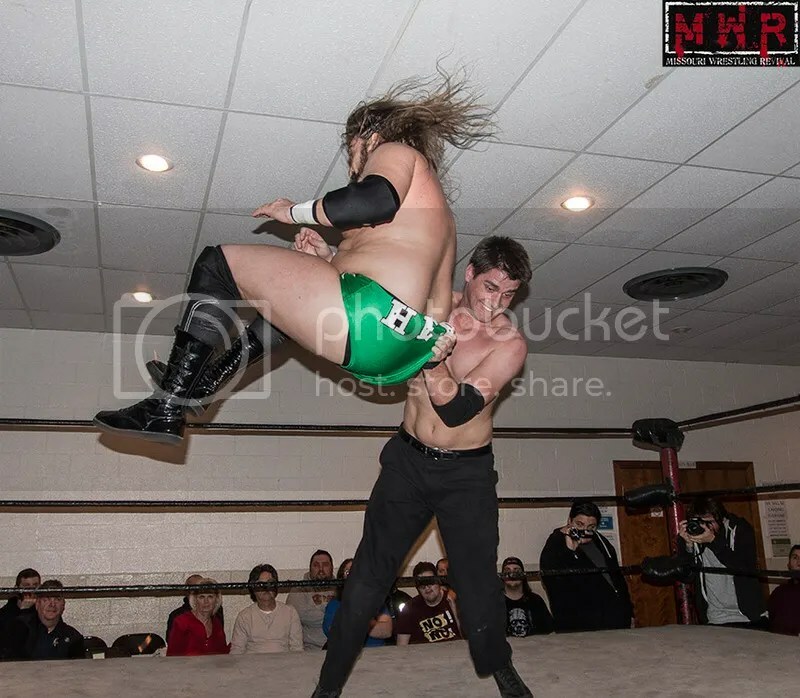 Gerald managed to fight back, but Fitchett countered a piledriver attempt on the apron by backdropping him onto the edge of the ring! 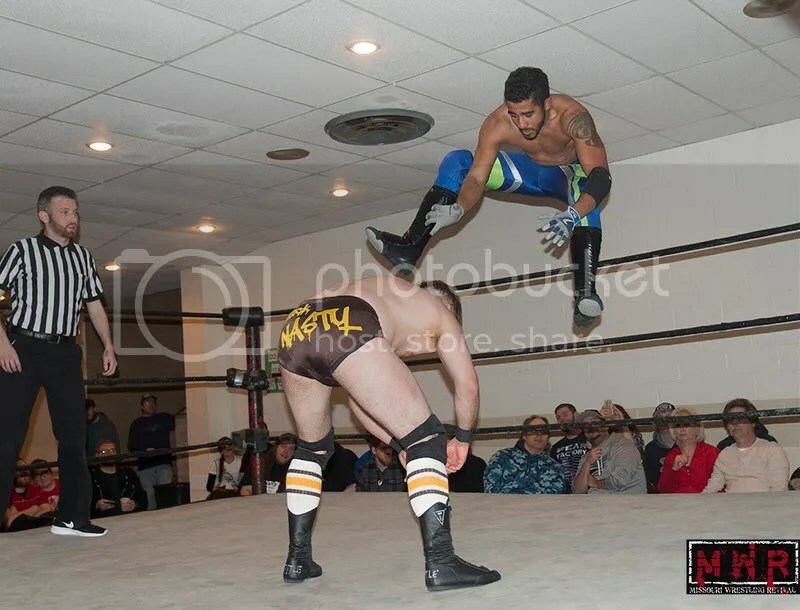 Fitchett set the champion up on the turnbuckles, but Gerald came back with a flying DDT onto the edge of the ring…eep. Fitchett was left bloody, but incredibly managed to keep fighting…he delivered a cradle pildriver on the floor(! ), then one more in the ring to FINALLY capture the title in 11:28! 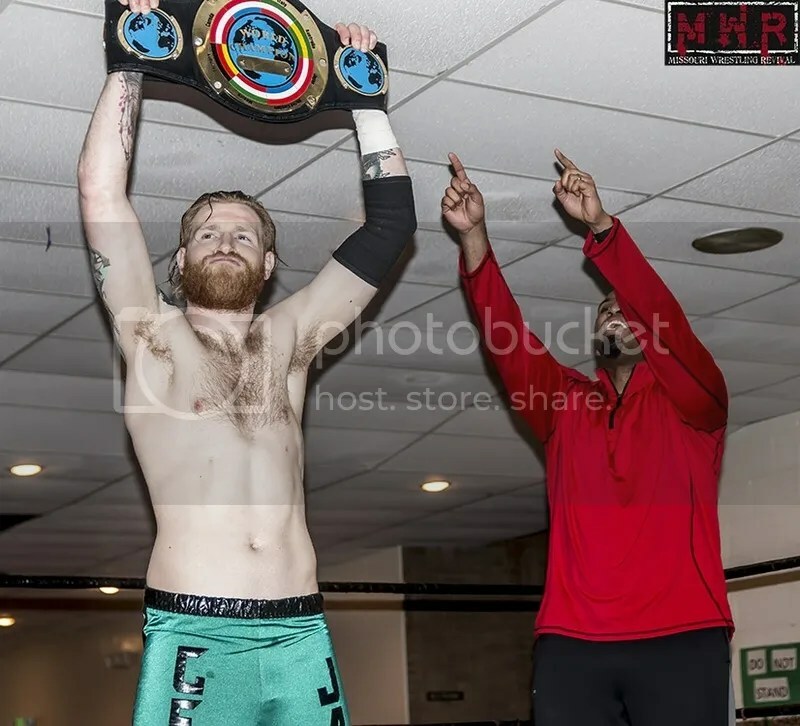 Davey Vega celebrated with the new champion, who had to be assisted from the ring…we found out the following night that Fitchett had suffered a concussion. Dorian Victor and Christian Rose went to the ring to help the former champion…but out of nowhere, Rose turned on both of them! Rose locked James in the No-Leaf Clover, yelling at him “YOU LOST!” before leaving the “father and son” laying in the ring. 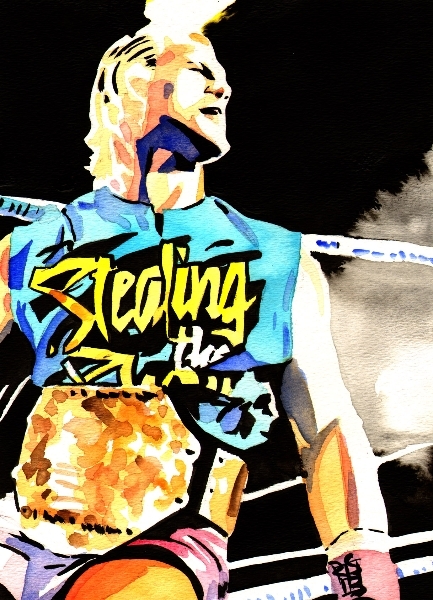 After all of that, James addressed the fans…he said that whether they loved or hated him, he had hopefully earned their respect after his long title reign. He wasn’t sure how much longer he had to wrestle, but he’d keep fighting. 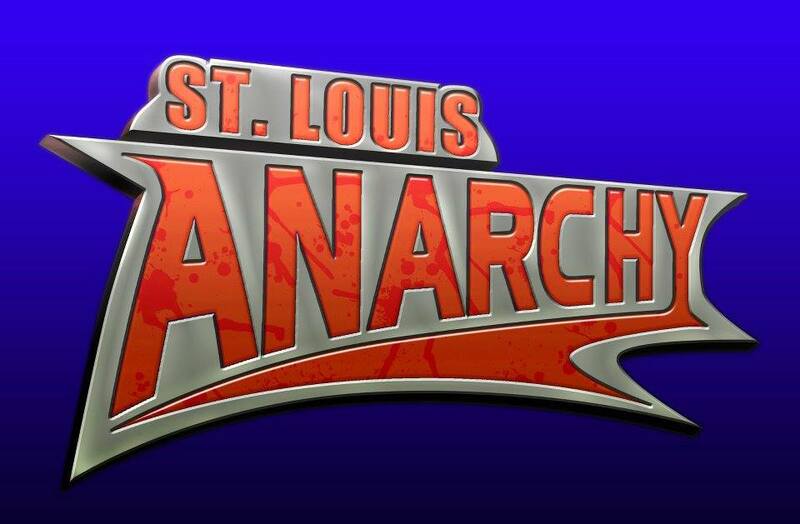 Purchase tickets here for the must see return show of St. Louis Anarchy. Please do not record show or stand on chairs. The winners of Hooligans vs. IOU and REL vs. Vikings will face for shot at SLA tag team titles.